Kinsale (; Irish: Cionn tSáile, meaning "Tide Head") is a historic port and fishing town in County Cork, Ireland, which also has significant military history. Located some 25 km south of Cork City on the coast near the Old Head of Kinsale, it sits at the mouth of the River Bandon and had a population of 5,281 at the 2016 census, which increases substantially during the summer months when the tourist season is at its peak and when the boating fraternity and other tourist visitors arrive in large numbers. Kinsale is in the Cork South–West (Dáil Éireann) constituency, which has five seats. Prominent historical buildings in the town include St. Multose's church (Church of Ireland) of 1190, St. John the Baptist (Catholic) of 1839, the Market House of c. 1600 and the so-called French Prison (or Desmond Castle - see Earls of Desmond, prominent in the history of Munster) of c. 1500. Charles Fort, a partly restored star fort of 1677, is in nearby Summercove. 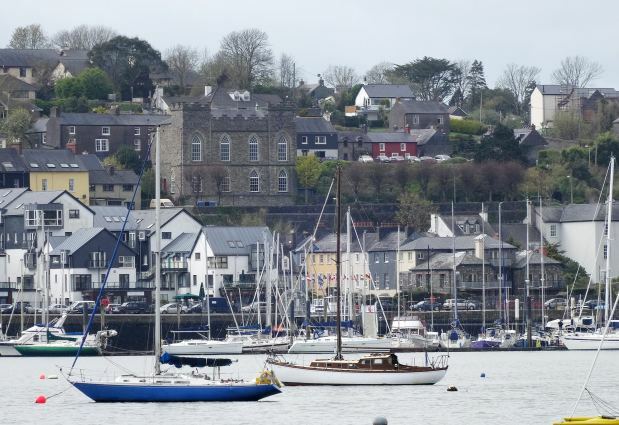 In 1333, under a charter granted by King Edward III of England, the Corporation of Kinsale was established to undertake local government in the town. The corporation existed for over 500 years until the passing of the Municipal Corporations (Ireland) Act 1840, when local government in Kinsale was transferred to the Town Commissioners who had been elected in the town since 1828. These Town Commissioners became the Kinsale Council under the Local Government (Ireland) Act 1898 and the Kinsale Town Council existed until 2014 when this layer of local government was abolished in Ireland as part of measures to reduce Ireland's budget deficit following the financial crisis of 2008-2010 (see Post-2008 Irish economic downturn). It returned two members to the Irish House of Commons prior to its abolition in 1800. In its history, Kinsale has also important occasional links with Spain. In 1518 Archduke Ferdinand, later Emperor Ferdinand I, paid an unscheduled visit to the town, during which one of his staff wrote a remarkable account of its inhabitants. In 1601 a Spanish military expedition - the last of the Armadas launched against England - landed in Kinsale in order to link with Irish rebel forces and attack England through Ireland. As a result, the battle of Kinsale took place at the end of the Nine Years War in which English forces led by Charles Blount, 8th Baron Mountjoy defeated the rebel Irish force, led by the princes Hugh Roe O'Donnell and Hugh O'Neill, which was allied with forces of the Spanish empire of Philip III of Spain and Portugal. Following this battle the Flight of the Earls occurred in which a number of the native Irish aristocrats, including the Earls of Tyrone and Tir Conaill, abandoned their lands and fled to mainland Europe. Shortly after the battle, James's Fort was built to protect the harbour. Kinsale is the first Transition Town in Ireland. It is a community-based group, supported by Kinsale town council. It looks for sustainable solutions to the challenges of peak oil and climate change. Public meetings are held on the third Thursday of every month. It has taken much guidance from the Kinsale Energy Descent Action Plan 2021, which has spawned further Transition Towns worldwide. Kinsale Yacht Club (KYC) began in 1950 and today has become a lively sailing club with events for all ages of sailor and social activities throughout the year. Junior sailing includes Optimists, Lasers and 420's. The yacht classes include Squib (keelboat), International Dragon (keelboat) and A-Class Catamaran as well as three Cruiser Classes (Class I, II and III). Kinsale Rugby Football Club recently celebrated its 25th anniversary. It has an underage system, a women's team and has both first and second junior men's team. 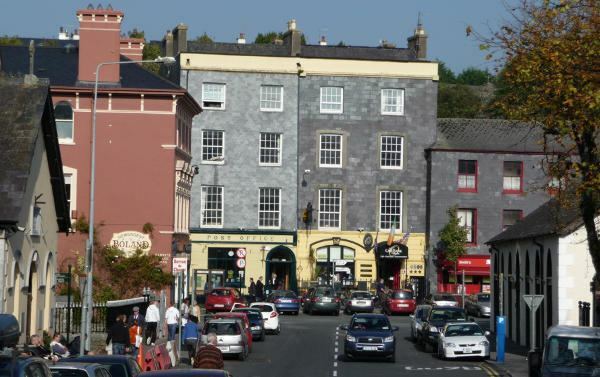 Kinsale hosts an annual jazz festival, which takes place during the last weekend of October. Many pubs and hotels in the town host concerts by jazz and blues groups throughout the weekend, including Monday (which is a bank holiday in Ireland).
. The town forms part of the Bandon-Kinsale electoral district on Cork County Council and is part of the Cork South-West constituency for Dáil Éireann elections. The largest planned development, of 2.9 ha, near the historic centre is the restarted Convent Garden scheme promoted by Cumnor Construction since the early 2000s (Cork County Council planning application 04/53026). This involves a combination of conversion of the austere rendered concrete former St Josephs Convent of the Sisters of Mercy on Ramparts Lane into 79 apartments and building in the grounds 94 new houses, with 295 car spaces, according to the Bord Pleanala inspector's report of 2005. After several years of inactivity, work on building the new units recommenced in 2015.. Initial phases of the new build houses have been sold but how the site will be fully built out, and how the former convent will be converted to apartments or otherwise altered, is not yet clear. For a period in 2007-9, a circa 18,000 sqm hotel, apartment and retail development was promoted by Fuschia Investments Limited, a company linked to Howard Holdings plc for the prominent site near the tourist office between Pier Road and Long Quay (Planning Register Reference Number: 04/53030), vacant since the (early?) 1980s and once the site of a Henry Good warehouse (and up to 1922 an RIC barracks). Scott Tallon Walker Architects undertook a design study for the development <http://www.stwarchitects.com/project-information.php?p=04098&t=i>. However, by 2011 the site had reverted to its use as a surface car park. The potential scheme now appears to be controlled by Clowater Asset Management Limited, of Cork. Abbey Fort is a residential development of 260 units by Dunboy Construction.http://www.dunboyconstruction.com/docs/abbey-fort.pdf/, at the north end of Kinsale, in which initial phases were completed in 2007-12. Part of the 22 acres of the site at Abbey Fort was sold by the National Asset Management Agency to Cairn Homes and Lone Star in December 2015 as part of the Ulster Bank Project Clear sale. Further units have been marketed from 2016 onwards, although parts of the main frontage to Abbey Lane remain to be developed in order to integrate the scheme into the streetscape. Another large new development is Kinsale Manor by Gannon Homes, located by the R605 continuation of New Road near the Cork County Council site and Community Hospital to the north of the town, where construction of the first houses commenced in early 2017. A press report in Carrigdhoun (see http://www.carrigdhoun.com/index.php/carrigdhoun/news-feature/plan-to-develop-40-social-housing-units-in-kinsale) in 2017 stated that 40 new social housing units would be constructed for Cork County Council at Commogue to the south-west of the town. Fiachra Ó Corragáin (1991-present) BA(Hons), DipABRSM, PhD; harper, musician, composer; born and lives in Kinsale.